Intimate and luxurious, Marina retains the same warmth and charm of her acclaimed consorts Regatta, Insignia, Nautica and Sirena. While the country club casual ambiance and level of personalized service remain the same, Marina offers even more choice and some enticing new amenities. Designed for epicureans and travel connoisseurs, Marina offers guests multiple dining venues, of which six are open-seating gourmet restaurants with no surcharge. La Reserve offers enlightening seminars, tastings, and gourmet food pairings. The Culinary Center is the only hands-on cooking school at sea, featuring a range of enriching cooking classes by master chefs. Similarly, talented artists-in-residence offer step-by-step instruction in arts and crafts in Artist Loft enrichment center. Baristas, our signature coffee bar, serves up illy® espresso and coffee and freshly made pastries. Intimate lounges abound. Accommodations in every category are incredibly spacious, especially with regard to the lavish bathrooms. One of France’s busiest commercial ports from the 14th to 18th centuries, it was the primary departure point for the founders of Montreal and many of the French Canadians. It is now a busy fishing port and the home of one of Europe’s great sailing ports. The city of Oporto is situated on the right bank of the River Douro, being the second largest city of the country. Oporto is the regional capital of the northern area. Rich from centuries of trade, modern Oporto is as much a cosmopolitan centre as it is a city steeped in the historical events of the past. The city is best known for its striking bridges and the much celebrated Port wine. Oporto boasts several important attractions, including the 12th century Sé Cathedral and the magnificent São Francisco Church with its striking gold encrusted interior. Crossing the bridge brings you to the true home of Port wine. Here, visitors can tour the world famous lodges, and taste local wines. The fishing towns to the north of Oporto boast some of the best fish and seafood restaurants in Portugal. Travelling south, within easy reach of the city, visitors are promised a relaxing beach side resort setting with hotels, clubs and casinos. It is difficult to sum up a past so full of adventures as that of the Saint-Malo city. Every corner of every street tells its own story. Just by walking along the ramparts or on the beaches you can imagine the great battles which the “small Saint-Malo community” took part in to preserve the character of this incomparable site. Don’t hesitate to visit the numerous museums which tell the great legendary moments of Saint-Malo’s history in detail. for new bookings only and may be withdrawn at any time. Free Internet amenity is one per stateroom; Owner’s, Vista & Oceania Suites receive access for two devices per suite. and do not include optional charges as detailed in the Guest Ticket Contract. 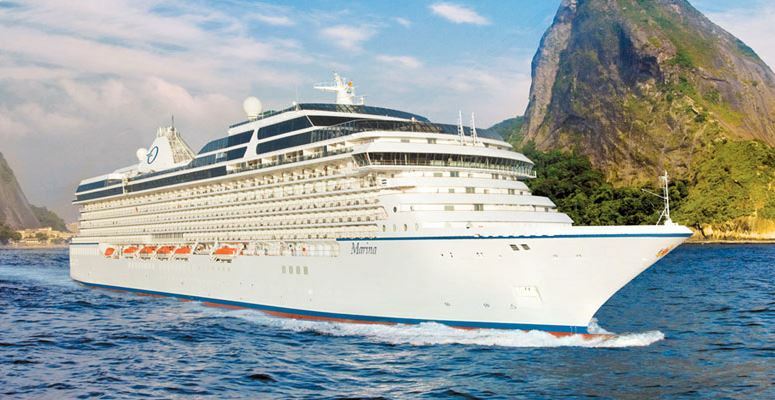 Cruise-Only Fares do not include OLife Choiceamenities or airfare. All Fares include government fees & taxes. and surcharges at any time. Ships’ Registry: Marshall Islands.